I am guessing this is a provisioning error as I have rebooted my gateway and ONT. Dont know if it applies to your connection, but have you checked your router QOS settings? 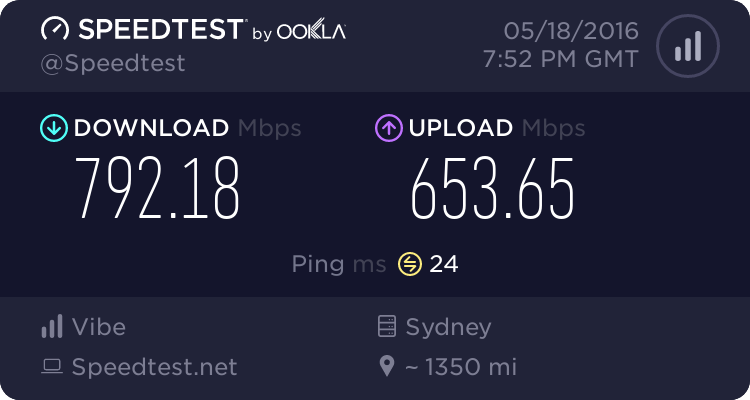 When I upgraded to the 200/20 plan with Vodafone, I was still only getting the old 100/10 speeds, because my router QOS was set to limit download and upload speeds to 100/10 until I changed it to 200/20. If your upload speed has increased to 450, then you will most likely be provisioned properly. Try and test downloading files from somewhere local OR use a different speed test server. 900Mbps will be the EIR at layer 3. So you are not guranteed that speed. If it were a CiR it would be a different story. (and price). Also try another computer....... And use firefox to do a speedtest NOT chrome. Nope, forget allll the browsers. Use the windows 10 speedtest app. This could also be to do with the LFC profile being updated but not the ISP BNG profile. It could be any number of factors and this is possibly one. So you saying you think they have created a QoS profile on the ISP's BNG that is just under the threshold that the LFC provisioned which stops the LFC's polt from dropping packets because the BNG will rate shape it. I know that vodafone do create these profiles, because my mum was on a 30/10 plan with vodafone. And after chorus upgraded evolve 1 to 50/10 it took vodafone about 2-3 months to change it until we were actually able to download at 50Mbit. It is possible that this is the case, however the problem with this theory is where they only set a QoS of 200Mbit on the download, normally they would have set an upload limit as well, generally in line with the plans they offer. If your radius user was on a 200/200 or 200/20 QoS profile before, and they have forgotten to update it, then your upload would be shaped as well and this doesn't appear to be the case. 2) Your CPE unit (router) is choking due to it trying to do too much, perhaps to many firewall rules etc. But FWIW I have tested my aging macbook pro plugged directly into a gig switch which is fed to MDR in Auckland via a 10gig link, and I have still had speed tests where my upload was about 930mbit and the download was about roughly 300. I tested with another machine on the same link, and got a full gig. So I actually think you need to try another computer.